I stopped at Kuala Gandah Elephant Sanctuary only for a few hours. I wish I had more time. When I got there I stood with others to listen to the rangers telling us the story of their elephants. It was obvious from the way they told the story that the elephants were a big part of their life! This is a story of conflict between human beings and the beast. As forests were cleared to sustain human beings the elephant came into a conflict with the villages. And unless made aware, we human beings can do a lot of damage to the beasts too! 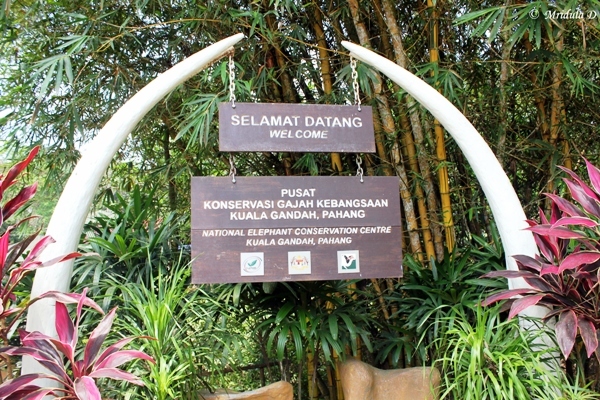 This is where the rangers from the National Elephant Conservation Center, Kuala Gandah come in. They make the people aware of the rights of the beasts and try to rescue rouge elephants. I heard and read that otherwise poisonous baits were put for the elephants. 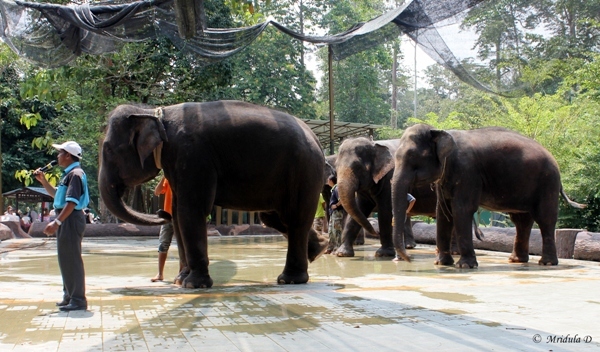 The park allows visitors to feed the elephants, take a ride on them and bath the baby elephants. I saw the feeding happen when i was there but could not watch the other two activities. I headed back to their auditorium for the video presentation. The video highlights the efforts of the rangers and what does it take to capture, transport, rehabilitate and release a wild elephant! It is a story that will capture your heart. It is a story to be watched and experienced. I wonder if it would be a good idea to put that documentary on Youtube? Tranquilizing a beast and then transporting it causes a lot of trauma to the elephant and it reflected in the faces of the people as well who do the job. From the documentary I could gather that the money is scarce and the rangers work against a lot of odds. Their ultimate aim is to release the animals in the wild again but they do not have enough money to successfully track the animals. The video ends on a very bittersweet note. 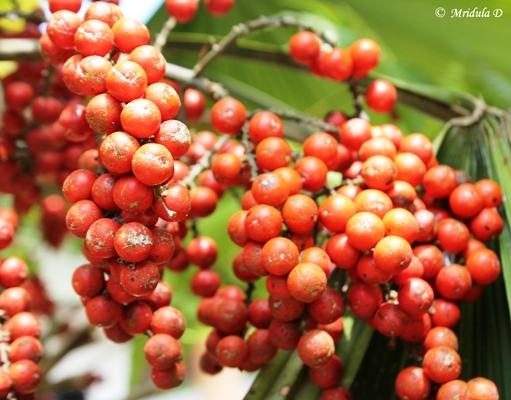 When I walked out into the sun again I saw these red berries glowing in the light. What a contrast to the shades of gray I saw through the documentary. I have trekked many times through a jungle, so many times that I am comfortable. I know the amount of noise any group makes is a guarantee that there would be no animals for miles around hence I am not worried. 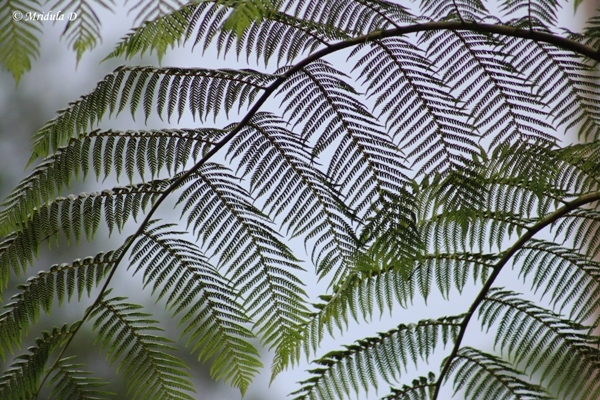 But the jungle acquire a different hue at night, one that is dark and somber. I have camped in jungles at night but hardly ever trekked at night. So it was with high anticipation I was looking forward to my walk through the Hemmant Trail (1 km long) at Fraser’s Hill, Malaysia. As we were a large group we were divided into two and I was with the first group. All of us had torches and without them I would have been lost. Both the groups had guides with them. A head count was taken to make sure that all of us got out of the jungle. Our guide was quite knowledgeable about the history and the jungle as well. Fraser’s Hill was discovered by Louis James Fraser in the 1890s. He operated tin mining operations and our guide was not at all happy with the tin mining and the damages that it caused to the fragile ecosystem. Mr. Fraser apparently vanished without a trace never to be be found again. Around 1 917 Fraser Hill attracted the Bishop of Singapore who thought it was ideal place to be promoted as a hill station and hill station it is today. It was relatively cool out there compared to other places I visited in Malaysia. As we were a very big group it was difficult to spot any animals. But our guide knew where spiders make their hidden traps and we had a fascinating time discovering it. Within the forest he showed some remains of the structures built during the mining era. He also pointed out that Fraser’s Hill was a birder’s paradise but we had better chances during the day. It started raining lightly towards the end of the trek and I jogged back with another participant. We found that high tea was waiting for us at 11.00 pm at night! I have to admit I still enjoyed it. It was the perfect end to a very wonderful day! I took a short video at the dance presentation at Sungai Pasu home stay at Pahang, Malaysia. Sometimes it is easier to talk via a video than words. You can see three Malaysia Tourism Hunt 2012 participants joining the locals. The gentleman who started it all was from Japan and he was quite popular with the ladies of Sungai Pasu after that! After the performance was over the ladies of Sungai Pasu went in for an extended photo shoot with the Japanese delegate! We had a short chat where he asked me if I knew of a video game Mario and I asked, “who Super Mario?” That was greeted with shots of joy and the question did I play it too? Sadly the answer to that is in the negative. The dancers were also quite gracious after the performances and would readily agree to pose with us. They would also invite us to dance at the end of the performances. This would lead to two scenarios. Some people would be waiting for the opportunity to get on to the stage and have a good time. And then there were some like me who would not give the eye contact to the dancers who would come to the audience and invite them, praying that they go away. I think we were equally divided! Apart from the formal dinner at Putrajaya, I always escaped. One good way to avoid dancing is to click pictures! Everyone leaves the photographer alone!